Originally conceived and produced in 1999 with fellow dancer Sarah Lowing, Dances for Dogs and People Who Walk Them showcased regular people doing short choreographed dances with their dogs. Presented at Meridian Hill Park in Washington, DC, in March of ’99, the event included a quartet, Four Hands/Two Leashes; a trio, One Walker/Two Leashes; Paw Deux Dogs,a duet performed by co-director Lowing and her blind dog Longfellow; and a group dance for fourteen dogs and their owners entitled A Dance for Dogs and People Who Walk Them. Music included big band sounds from the orchestras of Duke Ellington and Jimmy Dorsey. 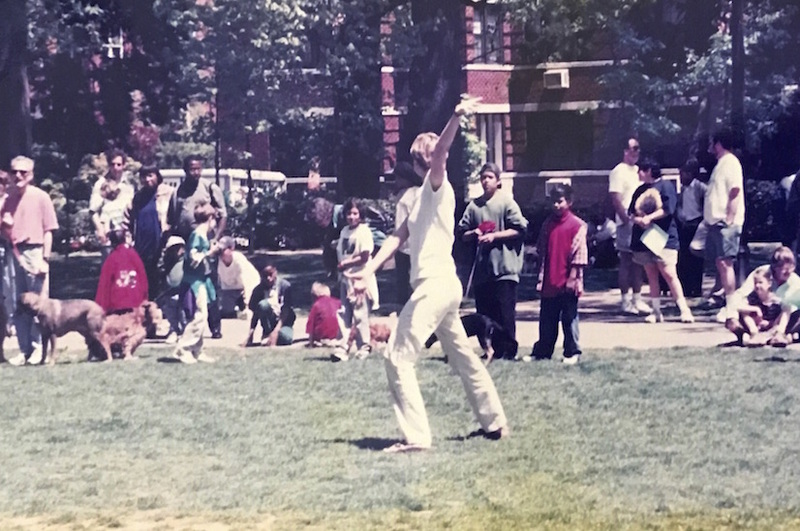 In May of 1999, Orr and Lowing presented the event again at Meridian Hill Park and this time included a new work, The Insta-Dog Dance. Orr taught this dance on the spot and it was a fun free-for-all for many of the dogs and owners in attendance. Orr premiered Dances for Dogs and People Who Walk Them in Austin in May of 2000. She added two new dances — Doggitango, performed by six elementary school children and their dogs, and A Dad, A Daughter, and a Dog, danced by 6 year-old Ava Sonleitner, her dad Steve, and their dog Jennie. Over 200 people attended this free event in Austin’s Zilker Park and nearly 50 dogs and their owners joined in for the finale the group improvised Insta-Dog Dance. Dances for Dogs and People Who Walk Them was sponsored by GSD&M, Emily Little Architects, Inc., Austin Parks Foundation, and Brykerwood Veterinary Clinic.